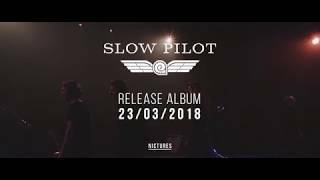 Slow Pilot is a new signing on our label Starman Records. They released their first single 'Dance The Night Away' back in 2014 which was picked up by Radio 1 instantly. In the last 4 years they performed in over 80 venues nation wide and also in the Netherlands. OLT, AB, Paradiso Amsterdam just to name a few. Pieter Peirsman the vocalist of the band also did many shows as solo vocalist with the world famous band Hooverphonic. However Peirsman is also a songwriter and he surely proves that with this release. The fantastic artwork is by award winning artist Stijn Felix. The official CD Release will be in De Casino in Sint-Niklaas on April 4th 2018.